Ticket prices: Adults – $15, Children (12 and under) – $10, Seniors and Secondary School Students – $12. Tickets go on sale on Monday, February 22nd! To reserve yours, please call the school at 705 792 6915, or email the school at info@unitychristianhigh.ca. Special Cinderella event this year: TEA WITH CINDERELLA! 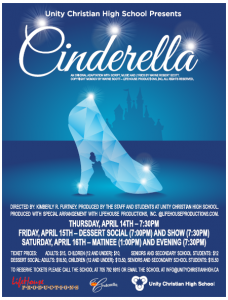 Please consider joining us for afternoon tea with Cinderella and her friends on Saturday, April 16th, from 3:15-4:30pm (at the school). This FREE event will include a photo booth with the cast of Cinderella, autograph books, tea, juice and treats, tiara and wand decorating and original Cinderella pages to colour. All children are welcome! If you know you would like to attend, please reserve a spot by calling the school (but walk-ins are also more than welcome). Unity Christian high school is putting on their 11th annual Spring Thaw race fundraiser. SATURDAY APRIL 16—Come support local Christian education as Timothy Christian School presents THE FINAL PIT STOP DINNER & SQUARE DANCE! Have you ever watched the Amazing Race TV show and wanted to be a part of that excitement? Join us for the Final Pit Stop Dinner, where you will be able to compete in mini Amazing Race type challenges and dine on finely catered BBQ with a western flare. Come dressed in your best western outfit to cheer on the teams arriving during the Final Pit Stop dinner. You will watch as they compete in their final challenge before we declare the winning team! As well you will be able to participate in our Live Auction featuring memory making adventures. Top off the evening with some square dancing fun. This event is open to your church friends, your extended families, workplace friends, couples who need a fun date night out. Tickets for the Final Pit Stop are $75/person and may be purchased at www.tcsamazingrace.org or the school 705-726-6621. Doors open at 5:30pm. Anne Springle on Wed. April 6 and Wed. April 20th. Anne Springle has a Master of Social Work and has been a family counselor in Barrie since 1995. She is a Christian parent with three teens. She loves to help families navigate the rough waters of our changing culture. She wants parents to lose their fears and adolescents to become braver. Families are facing serious mental health issues such as anxiety, depression, self-abuse and addictions. There is hope! Teens and parents are each invited to their own interactive workshop where all the issues will be discussed. You will leave with a greater understanding of the issues and lots of new tools in your family’s community toolbox! These sessions are open to all, please feel free to invite your friends. Coming up soon: Saturday, April 16, 7:30 PM at Springdale Christian Reformed Church, 1466 Fifth Sideroad, Bradford, an evening of song hosted by the Crusaders of Simcoe/York Region. Presented by the Ontario Christian Male Chorus Association, this evening features male choirs from the Hamilton and Niagara regions, with the York Regional Police Chorus as invited guests. Each choir will present individual selections, with all choirs joining together, a total of approximately 60 voices. Tickets of $12 are available from choir members or at the door, with children under 12 admitted free of charge. This event is hosted once every three years in our region, so you don’t want to miss this inspiring evening. ATTENTION CADETS, JR. COUNSELORS AND COUNSELORS! – ALL ONTARIO CAMPOREE – August 1-6, 2016 at Algonquin Park – The All Ontario Camporee registration is now open! Check out www.allontariocamporee.com for information, requirements and to register online. 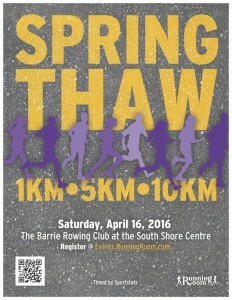 Early bird registration fees of $235 have to be postmarked by May 15; after that date the fee is $275. If you have any other questions please talk to your Cadet Counselors! CAMPOREE PATCH CONTEST Every cadet who has registered for the 2016 All Ontario Camporee is eligible to enter the Camporee Patch Contest. You must submit your drawing before April 30, 2016. If your design is selected, your camp registration fee will be reimbursed to you. Check the website for pictures of the patches from previous years. LIBERTAS MALE CHOIR – under the direction of Martin Mans and accompanied by Andre Knevel, will present a Spring concert on April 9, 7:30 p.m. at Rehoboth Canadian Reformed Church, 1225 Dundas Street, Burlington, Ont. L7R 3X4. Tickets online at libertasvoices.com, or at the door. Adult $20, Youth (14 and under) $10. Children under 10, free. For more information, emailinfo@libertasvoices.com or call 905-522-0001. Join Online Study with World Renew this Spring – Are you looking for an in-depth study about following Jesus more closely in your everyday life? Live Justly is a 6-week web-based curriculum that includes honest discussions about justice in our lives and our world. Study begins April 13 and concludes the week of May 18, 2016. The course is FREE, and study guides are available for purchase at worldrenew.net/order. To find out more and to register, contact ckritikos@intern.crcna.org. Southern Africa Ministry Team Leader – World Renew, an agency of the CRCNA, is seeking a Team Leader for Southern Africa based in Lilongwe, Malawi. The Team Leader will provide leadership in a region seeking to improve food security, build sustainable livelihoods and increase the use of household resources to improve maternal and child health. The position will be responsible for building collaborative regional and country teams under a unified vision of community transformation in Southern Africa, with a particular focus on programming in Malawi, Zambia and Mozambique. Please visit our website at www.worldrenew.net/careers for more information. This is just to advise you that we will be updating Covenant CRC’s photo directory this Spring. We will be posting reminders and schedules in the upcoming bulletins. Church Photo Directory Update – It is that time again for updating our Church Photo Directory. 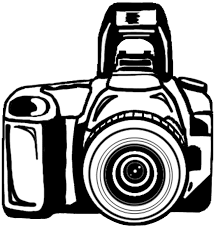 We will be starting to take pictures of our church members beginning on Sunday, April 10th after the morning service in Classroom D. Please try and make the date assigned to you. We will, however, be posting makeup dates at the end of schedule. If you are not able to make this time slot please speak to Jan or Kathrin Veenstra. OTTAWA – At a news conference today on Parliament Hill, the Canadian Conference of Catholic Bishops (CCCB) and The Evangelical Fellowship of Canada (EFC) released a joint statement on euthanasia and assisted suicide. The Declaration Against Euthanasia and Assisted Suicide has been endorsed by over 30 Christian denominations together with over 20 Jewish and Muslim leaders from across Canada. In light of the Supreme Court of Canada’s ruling in R. v. Carter, the joint statement advocates for palliative care, respect for the dignity of the human person, human solidarity and psychological, spiritual and emotional support as the ethical and moral response in end-of-life care. The speakers at the news conference included the following representatives: Ms. Julia Beazley, Policy Analyst, EFC; Rabbi Dr. Reuven P. Bulka, C.M., Congregation Machzikei Hadas, Ottawa; Dr. Aileen Van Ginkel, Vice President, Ministry Services, EFC; Sister Nuala Kenny, SC, OC, MD, FRCP, a pediatrician and former Deputy Minister of Health in the province of Nova Scotia, also speaking on behalf of the CCCB; Imam Samy Metwally Ottawa Main Mosque/Ottawa Muslim Association; and the Most Rev. Terrence Prendergast, S.J., Catholic Archbishop of Ottawa and CCCB representative. The Declaration Against Euthanasia and Assisted Suicide is the result of efforts of the Canadian Conference of Catholic Bishops (CCCB) and The Evangelical Fellowship of Canada (EFC) to collaborate on a response to legislative efforts and legal action that seek to revise Canada’s Criminal Code to allow the practice of euthanasia and assisted suicide. The Declaration demonstrates that commitment to the sanctity of human life and the importance of upholding human dignity leads also to a strong call for renewed efforts in relation to palliative care. Signing the Declaration will indicate broad support for its stated principles. It will also witness to the desire held by many in Canada to promote palliative care, home care and long-term care, and to ensure compassionate responses at all levels to those who are near death, as well those who are disabled, depressed, elderly or who feel burdened by physical or mental suffering and illness. If you support the Declaration Against Euthanasia and Assisted Suicide and would like to add your signature, please fill in the form below and click “Sign Now”. NOTE: Canadian citizens only please. Thank you. One signature per email, please.